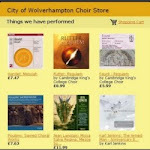 City of Wolverhampton Choir: England Expects! We all hope you had a great Christmas and that the New Year has got off to a good start. How are the resolutions going this year? This new term sees the start of our preparations for a stirring performance of Haydn's Nelson Mass. Additionally, we will be performing pieces by Holst and Vaughan Williams just to add that little extra to what will be a great night's entertainment. This concert will be in collaboration with the Wolverhampton Symphony Orchestra. This is something that we have been discussing for a while now and that we hope will be a continuing relationship between our two organisations. The concert will be on 21st March 2015 at St John's in the Square, sailing out of harbour at 7.30pm sharp. As ever, we welcome new members, we are an unauditioned choir and a friendly group. So do come along and see how you get on. The start of term is a perfect time to take up singing, the health benefits are well documented and it's more fun than the gym as a New Year's resolution!